AMONG the classical pieces of the masters, Handel’s “Messiah” has always been food for thought for me. The part that engaged my attention the most, was one taken from Isaiah 9:2 "The people walking in darkness have seen a great light;...". I have come to love and play this piece very often without recognizing the impact it would have on my life in these last days. Another portion, from Isaiah 9:6, also got my attention. It reads, "For to us a child is born, to us a son is given, and the government will be on his shoulders. And he will be called Wonderful Counselor, Mighty God, Everlasting Father, Prince of Peace." This verse eventually made me eager to seek the light diligently until I found it. But let me touch on this later on. Right now let me introduce myself. 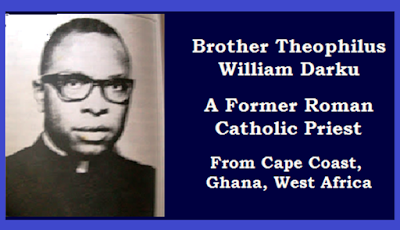 The name is Theophilus William Darku, born in Cape Coast, Ghana, West Africa on June 27, 1927. I come from a Catholic home with five other brothers who are all Catholics. My father died a Catholic, last February at the age of 73. My mother who is 74 years old is still living. I was a Catholic priest from 1953 to 1973. Let me interest you with a brief story about my first name. When I was born, my parents found out that I was sick. My mother told me I never cried even I was hungry; I never showed signs of something being wrong with me. I just lay there. This disturbed my parents very much; and as all parents would do, they tried everything and consulted doctors to get me well. Eventually on July 28, 1928 they gave me up, and took me to the church to be baptized, so that I would die a baptized Catholic. The old priest was amazed when the story of my sickness was related to him. He remarked “God loves this child that he preserved him till this day of baptism.” So the baptismal name he gave me was Theophilus, meaning lover of God. And that was how I, Theophilus William Darku, came to be nicknamed “God’s animal” when I started school. I attended St. Francis Catholic Elementary School. Then in 1942 I desired to become a Catholic priest. I went to seminary’s secondary school—ST. Theresa’s Seminary. It was wartime then, and the seminary was used as a strong hideout by high officials of the British army. As a result, the seminary was moved to join St. Augustine’s secondary school. It was at St. Augustine’s that I finished my secondary education in 1947. In 1948 I went to St. Teresa’s seminary to study philosophy for two years, and theology for four years. 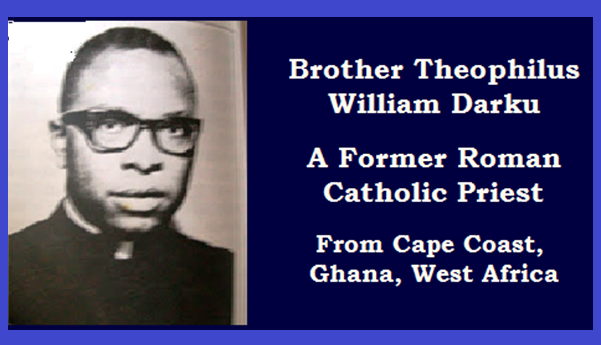 On Dec. 8, 1953 I was ordained a Catholic priest at St. Francis cathedral which is in Cape Coast, my home town. My first assignment was to go back to the seminary and teach Latin. I taught in the seminary till September 1954 when I was appointed assistant pastor to work with an old priest. I soon found out that I had to cater to 36 outlying towns and villages which were several miles away from the central station. Very soon the number rose to 72 when another section of the region was added. I was in-charge of all Catholic schools and churches in that region. I visited and stayed in each town or village once every two months. In 1958 I was transferred to another region where this time I had 60 towns and villages under my ministerial domain. Let me mention a few of the many things I did in these towns and villages. First, I was the assistant Manager of the Catholic schools in that region. I paid the teachers salaries at designated centers; set up bookstores for the sales of school books, equipment and church materials; made a quarterly accounting on equipment and maintenance grants received from the government; checked school and church reports, records involving teachers, students and catechists, always taking proper action when necessary to correct and improve the prestige of the schools and churches as well. I also officiated at church services—baptizing, hearing confessions, performing marriages and burial services. In short, I was doing everything a Catholic priest does. In June 1960 I was appointed chaplain to a Teacher Training College, where I also taught mathematics, history, religion and did other duties as part-time chaplain for Ghana Army, Navy, and Air force. In 1965 my bishop sent me to visit Rome, Amsterdam, and England, but through special contacts and arrangements I was able to travel parts of Italy, Switzerland, Germany, France, Holland and England. Then in August 1966 my bishop asked me if I would like to go to a university in the United States and study Business Administration. He also asked me if I was willing to do parish work while pursuing my studies in the United States. I naturally agreed to whatever he suggested because I was eager to get out of the country. On Oct. 17, 1966, I arrived at St. Rita’s church in Indianapolis. After the formal introductions and other such things I was shown my place and work. In 1968 I landed in the Indiana University school of business, where I got my Master’s degree in Business Administration. In 1970 I decided to join the Dominican Priests, so that when I went home in the country, I would be able to start a Dominican house there. Since in my country all the native priests are secular priests, I thought my going back as a Dominican would give aspirants to the priesthood a choice between secular and regular priesthood. My hopes were shattered when I found out that my bishop had written the Dominicans not to accept me. I used to spend my summers preaching in the northeastern states of the U.S to raise funds for the churches in my country. It was during one of these summers in 1971 that I questioned my bishop, when he visited the church I was working about his letter to the Dominicans. He spoke many lies to me, and finally I told him that if I couldn’t go to the Dominicans I would never work for him, and I would leave the priesthood. For a time I felt disillusioned. Human elements have crept into this work. I became aware that the churches are no longer for our good but for our goods. This bothered me very much. I decided to serve my God not according to the scheming and money-making devices which are a departure from the so called truth. Commercialism in the church, and the special attention its affluent members received, became apparent to me. In August 1973, a friend of mine, who is now in the University of California in Sta. Cruz invited me to spend my vacation with him and find time to acquire a teaching assignment in the University there. I considered his suggestion and so, in September 1973 I arrived in San Francisco in the first leg of my trip to Santa Cruz. Then, I changed my mind about the continuing journey. I told my friend that I would rather stay in San Francisco. In the meantime, I had written to St. Rita’s Church in Indianapolis that I was no longer in the priesthood and that I was looking for a job in San Francisco. I encountered many obstacles here in my efforts to find a job. Eventually, through the enthusiasm of some ex-Catholic priest in San Francisco, I agreed to accept any job until a better opportunity could present itself. So in May 1974 I started working at Bechtel Corporation. Things were not good for me and there were still people who looked to me for help and advice. As a result I stopped communicating with people who have known me. Only my parents and brothers had my address and knew my whereabouts. In the midst of all disappointments, I decided I would not belong to any church anymore until I have ended my search for the light. So I read my Bible at home, stayed out of trouble and communicated with Jesus. But then a verse in the Bible bothered me, Jesus said in Matthew 18:20, "For where two or three come together in my name, there am I with them.". this text engaged my attention for a long time and it became the reason why I would attend any church on Sunday, in order to be assured of Jesus being in the midst of the gathering. But then, I objected, because some of these gatherings are not really in the name of Jesus as most of the time the hidden aim is in the name of money. I concluded that my prayers still lacked the proper power, but I continued with my search for the real light, until something happened to change my life. It was June 1976 when a friend casually told me, "Why not go to the Orient for a meaningful life?” I said, "What do you mean by that?” She said, "You have been a Catholic priest for 20 years now and you are no longer a celibate. Why don’t you find a wife from the Orient? Orientals are noted to be very good wives.”. I told her I was not interested, but I have put before the Lord to give me a good and faithful wife. My friend gave me the address of a lady—Eugenia B. Banares, After much hesitation I wrote to the lady in Hongkong. Very soon some interest was fostered and the line of communication was opened and became frequent. In 1977 we talked about marriage but then there were the usual obstacles from the Immigration. Since we are not married yet, she couldn’t come to the U.S.A.. I was not an American Citizen so I had to wait till I became one. At the end of March 1978 I was called by the Immigration office to appear in court in San Francisco for my citizenship. Eugenia, whom I call Jeannie, has been praying for this too. Jeannie would be coming to the USA and I must find a way to make more money. I decided to write a request of transfer from my present job, to a better one. I was confident that with a new resume I would get one of those top jobs though it might take me away from California. Everything was set to go. Then came the spoiler. On April 21, 1978 I was told that according to my request for transfer I had been scheduled for an interview for a new job, and I was given three days to decide if I wanted it. I didn’t know I was taking a step that was going to influence and change my future. At the same time I was thinking of the copies of the resume I was ready to send out. I called up Jeannie that night to ask her to keep on praying. On April 25 I went for my interview for the new job. It turned out right but then I had to go and see the person who has given me a detailed description of the things involved in that work. The date was set for the 27th and 28h of April. On the 27th I went to see Brother Raul Nepumoceno, the person who was leaving the job I was supposed to take. After describing everything he asked If I would take it. I told him I would. Then came the switch. I told him I used to be a Catholic priest. I told him I just clung to my Jesus—my God and all. Then came the retort: Jesus is not God. I said, "Look here, this is what I have been taught in the Catholic Church and this is what everybody believes in the Catholic Church.” Then he said, "The minister of my church can prove to you from the Bible that Jesus is not God but a mediator.” I told him I could also prove from the Bible that Jesus is God. So he invited me to visit his church on Sunday, the 14th of May. After the worship service I went to see Brother Rizalino Santos who was going to give me proofs that Jesus Christ is not God. At first I thought I could easily refute his arguments with two verses from the Bible to show that Jesus is God—Isaiah 9:6 and John 1:14. However, he took the wind out of my sails when right at the start he quoted I Corinthians 4:6, which admonishes not to go beyond what is written. How I admire the calmness and dedication of Bro. Santos that day. I was convinced that Jesus Christ is not God . He proved it beyond doubt and I was ready to get up and leave, when he said, "Now let me show you who Jesus Christ really is, from the Bible.” I was really amazed. My treasured verse, Isaiah 9:6, couldn’t prove the divinity of Christ. I, therefore, asked Bro. Santos if I could get his notes on all the proofs that Jesus is not God. He told me he would going to Oakland for a ministerial class that Tuesday, and if I was willing, he would pick me up for the class. I agreed whole heartedly. After the class, he suggested that he come to my Apartment on Saturdays for Bible study on Doctrines. I told him it was alright to me. Later, out of pride I said to myself “If Christ is not God, so what? I am not going to attend any church again. I can stay home and just read my bible and stay close to my God.” I told myself I would attend one last doctrinal lesson and that would be final. Before that, however while reading God’s message, the magazine of the Church of Christ, I was struck by John 10:9—cited in one of the articles—wherein Jesus says, I am the gate; whoever enters through me will be saved.. Then I asked my self, how does one enter? (The answer to this was revealed to me later in that last class which I promised my self to attend.) Then I found a stronger power in my old text—in Matt. 18:20 "For where two or three come together in my name, there am I with them. ", Could this possibly happen in the gathering of the Church of Christ? More curious now, I became wager to be in the gathering. It was during this class that I met Bro. Fernando Ibarra, who, with untiring efforts, kindled my interest in the Church of Christ and continued persistently with many calls inviting me to attend different functions and worship services here and there. I can truly say that Bro. Ibarra, has been instrumental in my conversion to the Church of Christ. We used to chat on the power of Christ that I find in the gathering together of the members. At times when I didn’t want anybody bother me, Bro. Ibarra would insist on picking me up for a worship service, a church dedication, or a baptismal service somewhere. I am grateful that God has used him as the instrument for me to see the great light I read about in Isaiah 9:2. On the 26th of August 1978, I was baptized in Redwood City. It was a real happy day for me, to realize how all my sins were forgiven and that the good Lord had turned a new leaf for me. Now I thank the Almighty for leading me in these last days to the true light. In my heart I feel sad for my friends who embraced the Catholic faith but, because of pride, fail to make a true search for the light. I have compassion for the other people in my country who will embrace this light with joy and enthusiasm, but now have no one to bring this to them. I am sure that it’s God will that they should be saved too, and a way will be provided by the Almighty himself. No one knows his designs. For my brothers and sisters in the Church of Christ I say, hold fast to your membership because “Be sober, be watchful. Your adversary the devil prowls around like a roaring lion, seeking some one to devour.” (I Pet. 5:8). As I said, there is sufficient power in the gathering together (Mt. 18:20). Stay with the Church always, for Christ is coming. We are in the last days, you know! Now I wish and pray that more people will be called by God and given to Christ to be saved. Outside the body of Christ—the Church of Christ, there is no salvation—the bible says it clearly. Be saved and enjoy eternal bliss. This is coming from a former Catholic Priest. I was a priest for twenty years and I know what I am saying. It’s all in the Bible—the inspired book of God. Outside the Bible, its all human talk—not for your good but for your goods. As published in PASUGO Marh-April 1979 issue. 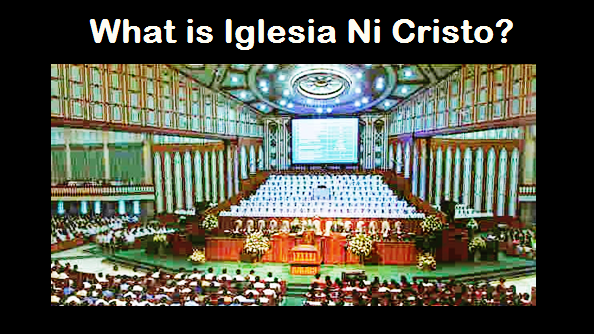 Know why more and more people around the world convert to Iglesia Ni Cristo (Church Of Christ).